John E. du Pont (Steve Carell), a wealthy patriot who constantly seeks out his mother’s approval, convinces wrestler Mark Schultz (Channing Tatum) to join Team Foxcatcher to bring the glory days back to the US at the 1988 Olympics in Seoul. Under his guidance, Mark slowly loses form and soon his brother David (Mark Ruffalo) is drafted in to help. But all three men are set on a collision course as du Pont’s behaviour grows ever more erratic and unpredictable. Another real-life story to get the big screen treatment, Foxcatcher garnered great acclaim during last year’s London Film Festival. Director Bennett Miller has done a commendable job bringing this bizarrely-true tale of misplaced trust and tragedy to the big screen. Going into this not knowing much about the life of John E. du Pont does help and makes the finale that much more impactful. Those familiar with this tale can rest assured that the material is handled honestly, without the need to over sensationalise events. Steve Carell proves that he’s more than just an accomplished comedian and he is on mesmerising form here. It’s a transformative performance full of nuance and delicate terror. In fact, all of the actors are amazing here, with Channing Tatum and Mark Ruffalo providing many noteworthy scenes. Ruffalo, in particular, is amazing as the good-natured brother trying to steer his younger sibling on the right path. The emotional dynamic between all three makes Foxcatcher a big success. It’s a shame that after an initial period where he praised the project, the real-life Mark Schultz has now condemned the movie for what he calls factual inaccuracies. Quite what has happened between now and then is unclear and it’s a shame that this has all come to light just weeks before Foxcatcher’s campaign push for awards. 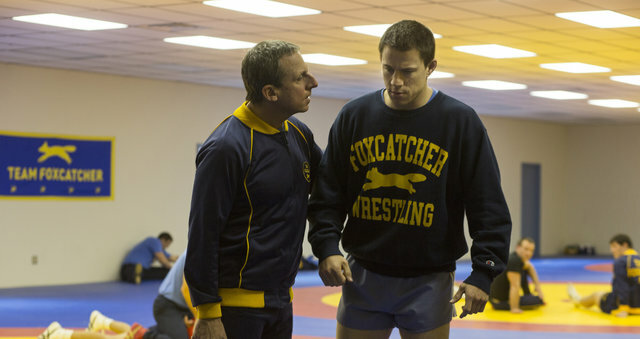 Foxcatcher is a compelling story than proves that real life is far stranger than fiction. The palpable tension running throughout the film is expertly handled by a stellar cast of actors. But despite their best efforts, Foxcatcher falls just short of guaranteed award-season gold – especially given how good this year’s competition is. But nevertheless it’s an absorbing and sobering watch that deserves a big audience.